Are you a Stampin’ UP! 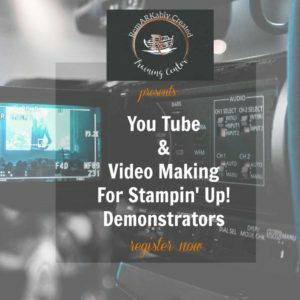 demonstrator who wants to make videos? Are you overwhelmed by the idea? A few years go when I started I was overwhelmed and thought it was some big expensive time-consuming thing. And it was that thought that kept me from starting for many years prior to taking the plunge. In addition there was no training and no one sharing how they were doing it. So I muddled through with my “idea” of how to do it! While I am not an expert I have grown my business thanks to You Tube and I am still learning, evolving and growing my knowledge of You Tube and Videos and love helping others discover that it’s not as hard as you think. . In additon using a facebook group allows the class to be taught with video, graphics, engagement and offers you the opportunity to ask questions. This is not a simple one hour webinar. It’s a unique training experience! Register Today – $14.99 Business investment – CONTACT ME – janet@remarkablycreated.com to register today. I look forward to sharing what I’m doing to continue to grow and work my business as well as my past experiences. This training is FREE to members of my team as part of my upline support. If you are a team member and have to join us in class contact me for the link.